Historic aerial photographs give a fascinating perspective on how places change over time – now all the more fascinating when compared with aerial photography from free mapping websites such as Live Search Maps or Google Maps. Scanning through aerial shots of Glasgow over the last 75 years in Glasgow from the Air by Carol Foreman of the RCAHMS, I was struck by how Glasgow’s nineteenth century working class neighbourhoods have been ripped apart since the Second World War. This is no revelation, of course: Glasgow’s post-war slum clearance is renowned the world over. Let me be clear: I have no wish to romanticise life in overcrowded flats where less than 3% of dwellings has a bath and under a quarter had a toilet. There are still plenty of Glaswegians alive who were brought up in those conditions in the Gorbals, the East End, Springburn and the city’s other Victorian working class neighbourhoods who would put me right on what life was like. Nor do I think that the pollution and health problems caused by heavy industry – blast furnaces, chemical manufacture, heavy engineering – being located cheek by jowl with housing can have been anything but appalling. I’ve heard enough stories from folk in Carmyle and Shettleston about red dust settling on entire neighbourhoods – and no doubt being inhaled by entire communities – to understand that the quality of life and health in many working class districts must have been horrific 50 or 100 years ago. With housing and health problems on this scale, it’s no wonder that it was such a priority in post-war Glasgow to redevelop vast areas of the city, building new housing with better facilities and segregating it from polluting industry. Yes, there were massive improvements in quality of life. But the brave new world of the new 1960s and 1970s high-rise flats was not without its flaws – as anyone who has heard of schemes like Hutchie E in the Gorbals will know. Studying the images in Glasgow from the Air, what really struck me was the massive fragmentation of the urban fabric that took place throughout the post-war period. Forcing the M8 motorway through the city is perhaps the best known example of this (see photo on right). But there are many other examples. Careful study of aerial photos reveals the degree to which the city’s working class 19th century neighbourhoods have been fragmented by destruction since 1945. I’ve chosen a couple of examples – Bridgeton and Springburn – to illustrate what I mean. The before and after photos below of Bridgeton show the centre of this community in 1979 – after the peak of demolition – and again in the last couple of years. What the photos don’t show, of course, is that a similar photo taken a few years earlier would show a largely intact urban fabric: the street pattern would be largely the same as 1979, but full of buildings rather than wasteland. In the years since 1979, the wasteland has been filled in again with buildings, as the more recent aerial shot shows. But for 30 or 40 years, Bridgeton has been a physically shattered neighbourhood, with more empty land than buildings. It is a tribute to the resilience of the local community that Bridgeton still has an identity as a distinctive place. Springburn has suffered similar ravages, as shown by the photos below from 1947 and then 60 years later. The later photo demonstrates how the Springburn bypass opened in 1981 creates a huge barrier right through the heart of the neighbourhood, weaving north-south through the centre of the image and splitting the community in two. Springburn Cross, so evidently the focus of the community in 1947, has disappeared. Tarmac and landscaping take its place in the recent photo, and the community focus has gone. The motivation for the change was evidently not so much improving housing conditions as a desire to allow faster road access between the city centre and the northern suburbs. Fast forward to the present day. Glasgow is still the focus of intense change as its economy has changed from manufacturing to services, with the built environment inevitably playing catch-up. I am currently part of a consultancy team working for Glasgow City Council led by yellow book to prepare an economic development strategy for an area focussed on Port Dundas, stretching north from Glasgow city centre to the edges of Woodside, Possil and Sighthill. Would the area remain primarily industrial? What kinds of employment should be focussed here? Should the city centre expand northwards? Should there be more housing in the area? How will the area connect to surrounding neighbourhoods? What is the future for the canal? What is likely to happen to the area if market forces are left to themselves? What should the public sector try and achieve for the area? Personally, I am acutely aware of the responsibility of not repeating the mistakes of post-war Bridgeton and Springburn – mistakes which I believe came about fundamentally from having too narrow a focus on one or two issues, and implementing inflexible proposals which were unable to adjust to the inevitable unforeseen changes in circumstances. The physical fragmentation suffered by these communities results from concentrating on housing and roads without paying attention to other detailed issues which affect residents’ quality of life, from being able to walk easily to the local shops to having good quality greenspace and public realm on your doorstep. Our team’s solution to these issues is collaboration – involving as many people as we can, as early as we can. For Port Dundas, this means we are facilitating workshop discussions with health, transport, planning and other people to explore the kind of questions mentioned above (and many others). But this is just the start of the process. Once our involvement with this time-limited commission finishes shortly, responsibility will pass back to the Council to nurture and expand these embryonic discussions to take in as many people as possible with an interest in the area – businesses, residents, politicians and other experts. My message? We should all be aware of the pitfalls of relying on one group of professionals to produce a workable plan, be they architects, planners, engineers or surveyors. 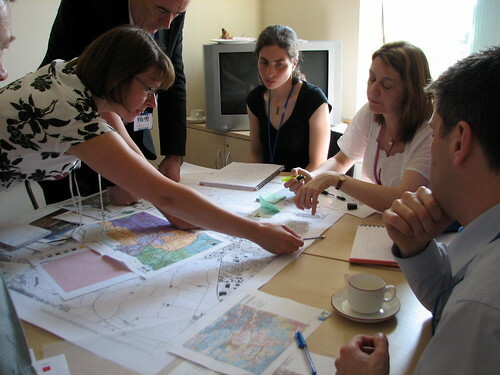 It’s important to get as many people involved as possible, to make the plan flexible, robust and all-encompassing. To explore the RCAHMS’s free online archive of aerial photography, click here. To compare then and now, go to Live Search Maps (check out the superb bird’s eye perspective images) or Google Maps.